What is Student Volunteering Week? 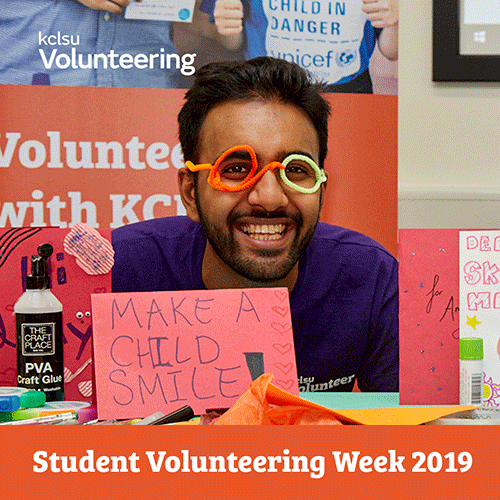 Student Volunteering Week (SVW) is a national week of action, involving over 60 higher education institutions, featuring events and volunteering taster activities from a range of societies and charity partners. This year it is taking place from 11th to 17th February and throughout the week King’s are hosting opportunities and events to help students begin their volunteering journey. Why not start off the week by attending the volunteer meet and greet. This is your chance to meet with volunteer officers, find out about volunteering opportunities and learn how to get involved. The volunteering fair is also a great place to talk to students about their projects and ask any burning questions you might have. From mentoring young people to planting trees, befriending the elderly to helping the homeless, there are a range of long term, short term and one-off volunteering opportunities available. How can volunteering benefit me? Volunteering is not only a great way to give back, but it is a chance for you to build experience. According to the NCCPE, 51% of recent graduates under 30 said that volunteering helped them to secure paid employment. During the week, KCLSU are hosting a volunteering workshop to help you reflect on your experience and think about how you can communicate the skills you learn in job applications and the workplace. You can also gain recognition for your volunteering by taking part in the King’s Experience Awards, a 12-week programme designed to connect your experiences in and outside your studies. As this programme is based on experiential learning, your volunteering can count towards your award and provide a good foundation for your self-reflective assessment. If you manage to log enough hours, you can also apply for the KCLSU Volunteering and Fundraising Award. From Bronze to Platinum Awards, this recognises your efforts and commitment! Make sure to hashtag #svw19 if you post about your volunteering on social media and follow @KCLSU to keep up to date on news and events!